TAMPA, FL, June 27, 2013-Tampa-based Acoustiblok, Inc. achieved a record year in 2012 in terms of total sales revenue and volume of product shipped despite slow moving economies in the United States and many countries across the globe announced Lahnie Johnson, Acoustiblok's president and founder. 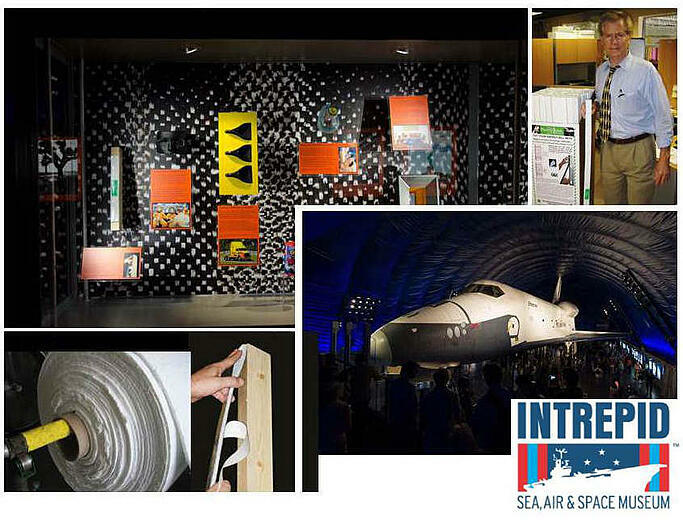 Acoustiblok, Inc. invents, manufactures and sells acoustical soundproofing products to a multitude of industries. The company, which was established in 2001, is now shipping products to approximately 60 countries across the world. Acoustiblok achieved a 21 percent increase in total sales revenue from 2011 to 2012. Slow economies have not slowed the success of this growing business. While domestic sales still dominate Acoustiblok’s revenues, international sales are increasingly becoming a higher percentage of the company’s total sales. In 2010, international sales accounted for 12 percent of total sales. In 2011, that figure increased to 19 percent and in 2012, international sales reached 24 percent of total sales. “With our growing international distributor network in Europe, Australia, South Africa, South Korea, South America, and our efforts in the Middle East through our subsidiary, Acoustiblok Mideast located in Saudi Arabia, our international sales are starting to grow at a faster rate than our domestic sales,” said Johnson. A number of factors contributed to Acoustiblok’s record sales year in 2012. One of these was a more targeted marketing and sales effort that now spans across the U.S. border via cyberspace. In August 2010, Acoustiblok began using HubSpot inbound marketing software to integrate website, search engine optimization (SEO) efforts, email marketing, blogging, and social media marketing into one system. Hub Spot also provides daily electronic lead generation and analytical data that improves marketing and sales related decision making. With HubSpot’s analytics capabilities and the use of Google AdWords campaigns, Acoustiblok can quickly run targeted online sales campaigns for niche markets in all parts of the world any day. “We are now interfacing with potential leads literally all over the world in many different forums across all the industries we serve. This helped us increase sales of our popular Acoustifence product from 11 percent of total sales in 2011 to 18 percent in 2012,” Johnson said. With increased product sales come increased shipping volume and more work for our warehouse associates. Acoustiblok also set a company record for the amount of product shipped in 2012. While the company was already shipping to countries such as Saudi Arabia, Mexico, the United Kingdom, Canada and Russia to name a few, in 2012 they also shipped to new countries such as Norway, Hong Kong, Sweden, Germany, Romania, Peru, Singapore, and Malaysia among others. Two of Acoustiblok’s top selling products, Acoustiblok soundproofing material andAcoustifence, are shipped in large, heavy rolls. The company’s unique and sought after All Weather Sound Panels are hand built at the Tampa location. The large sound panels come in a variety of standard sizes but are also custom built to fit the individual needs of customers. The patented panels are unique as they not only absorb but also block sound and are wind tested for up to an impressive 270 MPH wind load according to Johnson. “This was also a record for us. It was the most All Weather Sound Panels and Acoustifence we have ever built in one year. I am very proud of our crew,” said Johnson. Johnson, who founded the company in 1998, is not only an entrepreneur but also an inventor. He leads the new product development efforts for the company, an area he is very passionate about. If things continue to go well for Acoustiblok in terms of sales, there are indications that 2013 could be another record sales year. With international sales becoming a higher percentage of the company’s total sales, Acoustiblok continues to look into new markets overseas. In December 2012, Johnson was part of a high-level delegation of Florida business leaders that accompanied Florida Governor Rick Scott and Tampa Mayor Bob Buckhorn on a trade mission to Barranquilla, Colombia, Tampa’s sister city. The mission was part of a strategy to promote Florida exports worldwide and help pave the way for Florida companies to enter or expand their market share in Colombia and attract foreign investment. The trade mission was organized by Enterprise Florida, the state's economic development agency. Colombia is Florida’s second largest trading partner, with trade totaling more than $9 billion in 2011. It is also among the top five destinations for Florida products, amounting to nearly $3 billion in exports. “The trip was about opening business channels that will benefit growing Tampa area businesses like Acoustiblok. We are hoping to benefit from the rising foreign direct investment from Latin American countries in Florida,” said Johnson. The demand for noise suppression is growing across the world. It’s now become big in Saudi Arabia. In 2012, the Kingdom developed a comprehensive framework for measuring and monitoring environmental hazards, which included community noise, noise from industrial units, noise from construction activities, noise from vehicles and noise from equipment used outdoors such as residential standby generators, which are being used more and more across the world. In the United States, noise and nuisance laws are on the rise at the local level. As a result, soundproofing and noise control is starting to gain more awareness, although there’s still a general lack of understanding about the true capabilities of these modern acoustical materials with many consumers. The residential standby generator market in the United States has risen significantly over the past decade and especially in recent years. Fears of being without electrical power for prolonged periods of time following natural disasters and storms are driving this growth, along with more affordable residential generator units. “Standby generators run at high sound decibel levels, ranging from 65 – 100-plus decibels, which often exceeds levels for residential noise ordinances not to mention the angry neighbors who have to listen to the noise, especially if that neighbor does not have a generator of their own. The interest in mitigating generator noise with acoustical sound absorption barriers is also growing. These modern acoustical materials cut noise heard by the human ear in half and will help keep generator owners from being cited and fined for nuisance violations,” Johnson said. While overseas sales of Acoustiblok products are helping the company grow, they are also developing new products and constantly innovating our products into new industries and uses for other soundproofing applications. “Inventions without innovation is meaningless. Fortunately, we have great products which can be inserted into literally hundreds of sound uses,” Johnson said. Getting attention in today’s mass marketed world is not easy for smaller companies. Johnson said the company draws attention to the fact that what makes Acoustiblok different from the other soundproofing companies in the United States is not only the amount of certified lab tests done on our products, but also our ability to help customers find technical solutions to their noise problems. “Whether a solution is needed for a noisy generator at a large industrial facility, to help reduce noise in a large multi-family housing complex, absorb sound at a doctor’s office or gun range, or even to quiet a home HVAC unit or boat motor, more than likely we have already created a similar solution for someone,” Johnson concluded. For more information on Acoustiblok products visit the Acoustiblok website (http://www.acoustiblok.com), send an Email to sales(at)acoustiblok(dot)com, or call 813-965-4373.